On the beach, Beautiful ocean views. Paradise!!! Your relaxing Hawaiian vacation is calling! This is the place to come and unwind from the hustle and bustle of everyday living. It is currently whale season so come watch the whales right from your own private lanai! Warm breezes, intimate setting with beautiful ocean views. Oceanfront building located on a beautiful white sandy beach that you can walk on for miles or just simply lounge at while soaking up that good ol' Maui sunshine! Kihei/Sugar Beach is a very convenient location as it is centrally located and is just a short drive to Wailea, Lahaina, and Kaanaapali. Kihei is a quaint relaxing area away fronm the hustle and bustle yet is just a short drive to it for the nightlife if desired. For the outdoors, enjoy a wonderful BBQ area located right next to the beach lit by tiki torches at night, or stroll down the long white sandy beach. Golf courses are also just a few minutes drive, along with kayacking, snorkeling, biking, and lots of sight seeing. The condo was renovated and as you can see by the pictures it has been tastefully done and is fully equipped with everything you could possibly need to enjoy your stay and share in our wonderful piece of our paradise. So, what are you waiting for? Contact us now! Last minute specials available, SEND AN INQUIRY TODAY! Mater bath: shower, vanity and toilet. Second Bath: tub/shower combo, vanity and toilet. Towels, tissue, toilet paper, and hair dryer provided. Although we are one unit back from the direct ocean view, the entire condo is on the beach. Our unit has a beautiful ocean and mountain view. All you have to do is walk down the stairs, and voila, you are at the beach! As you sit on your lanai, you can enjoy a soothing view of the ocean. Living room contains a sleeper sofa, one chair and ottoman. There are some pantry items such as salt, pepper and such. Place settings for six in the white ceramic dish wear, plus an array of plastic plates. Dining area and living area are one room. By beach and grill area. Enjoyed my stay after a couple of initial issues! The overall stay was great the other guests were very welcoming and helpful, I was somewhat disappointed when I first walked in to my condo unit floor looked dirty walls appeared to be dirty but as it turns out the floor has some chips in it and the walls really need to be painted but they weren’t dirty. The sheets on the king bed were so thin you could have read a newspaper through them! The thing that used to be a sponge mop was broken, but after trip to Walmart got some new sheets a new swiffer, and a mat for the front entry and a can of WD 40 for the squeaky front door ( I left everything for the next renter) things went pretty well, I’ve been in Maui many times have never stayed at Nani Kai Hale before but would certainly stay here and would stay in 608 again. To future guests always be prepared to purchase some items to make your stay more enjoyable. I usually budget $50.00 that way you shouldn’t be disappointed. Larry Moser Clarkston wa. We absolutely loved our stay at Annbritts condo. 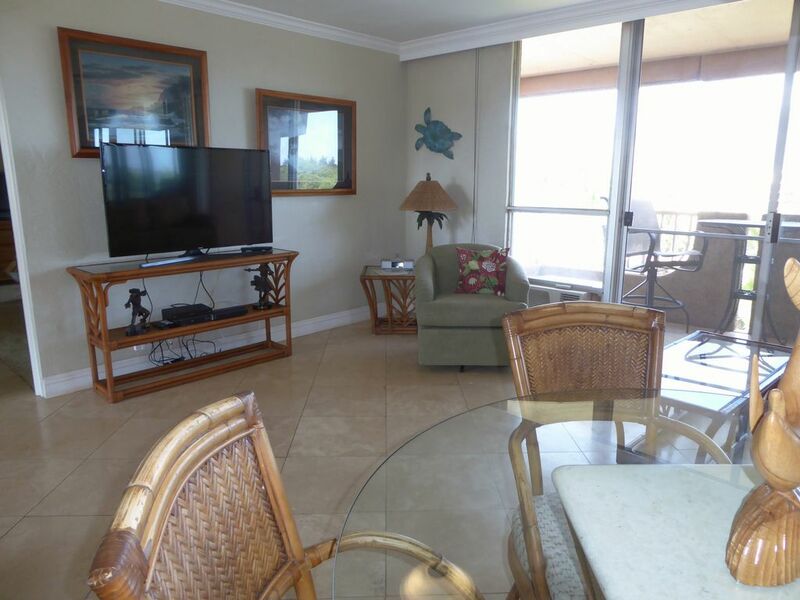 It has everything you need and the views are so wonderful...both on the lanai for sunsets and at the entrance door taking in the morning sun over Haleakala. Nani Kai Hale is a central location so is very convenient to get to all parts of the island. It is a quiet building and well maintained. The beach is nice and soft for walking and for a cooling dip in the ocean. Annbritt is very helpful and accommodating. Mahalo!! Had a great time in Maui!!!!! This condo was wonderful! Right on the beach and close to many activities. The property was very well maintained and the guest and condo owners were friendly. The condo was spacious and sitting out on the lanai watching the sunset was awesome. Very well stocked with everything you would need (towels, beach towels, pots, pans, plates etc.!!! I would definitely stay here again and would highly recommend this condo! The owner always would respond to any questions or concerns you would have in a very timely manner. Thanks again for such a wonderful time! Great condo in a great complex! Not the newest condo but it was comfortable and clean. Annbritt was a pleasure to work with and prompt in answering any questions. These condos are quiet and this one had a good air con system. There were a few nights that were humid and stuffy so we turned on the a/c for an hour before bed and good sleep was had. Once payments are made, they are non-refundable unless space can be re-rented and refunds in that case are pro-rated and exclude credit card and processing fees. Rates subject to change until reservation is confirmed.